General education workshops cover asthma as a disease, recognition of warning signs, recognition and control of triggers and asthma medications. Correct usage of inhalers with practice sessions. Use of peak flow meters and their importance in objectively evaluating symptoms. 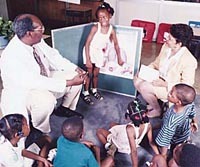 Communicating with your physician, children's schools and employers regarding asthma and its management. Understanding how exercise affects the disease. How to develop an emergency action plan and its importance in helping people to live with asthma.